A decade ago, Terry Messmer, PhD and his graduate students from Utah State University Extension's Community-Based Conservation Program started working with Jay Tanner on his ranch. Messmer and his colleagues have moved on to work with other ranchers, but with their help and the subsequent technical and financial support from the NRCS through the Sage Grouse Initiative and Utah's Grazing Improvement Program and Watershed Restoration Initiative, Tanner has accomplished 12,000 acres of rangeland restoration, native plant seeding, and juniper removal on his land. Juniper is a conifer native to the American West, but a combination of fire suppression, historic overgrazing by livestock and favorable climate conditions have led to an invasion of juniper into the sagebrush-steppe where it was formerly scarce. This trespasser is a water thief in a desert habitat where water is scarce. 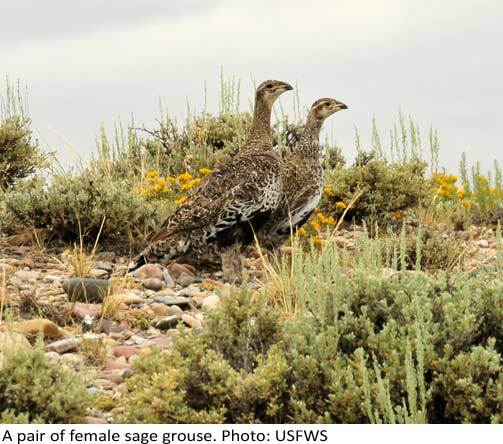 It also shades out and competes with understory grasses and herbs for water and nutrients – the very same plants sage grouse use for cover and forage. Taller junipers also serve as perches for birds of prey. Patience and a willingness to be flexible were major themes of our discussion. While numerous studies and management plans have been written about sage grouse and sagebrush steppe-habitat restoration (many of which can be found on our Conservation Habitat Management Portal), local conditions vary, and what works in southern Wyoming may not work to the same degree in northwestern Utah. As part of the habitat restoration effort, Tanner applied the herbicide 2, 4-D to control unwanted brush prior to seeding. At the time, some of the wildlife biologists didn’t like the technique because they thought it might be too broad spectrum and kill everything. But the application of 2, 4-D worked, and all involved later agreed that it was an effective technique for controlling weed competition. To date, research done on the green strip has shown the forage kochia not to be a large portion of the sage grouse’s diet. But Tanner thinks that conclusion might have been premature – that the plants weren’t fully established at the time. Encouragingly, Tanner is but one of a many in the northwestern Utah working to restore sage grouse habitat. “I think private landowners here have made significant strides for sage grouse conservation,” he says. Tanner adds that, while landowners like him, with help from government programs like those mentioned above, have been working to conserve sage grouse for almost a decade, similar efforts on public lands are just getting started. This is not an indictment; Tanner genuinely expresses “hope that the public lands can catch up,” which is a sentiment I think we all can share.